January 3, 2019 at 10:55 am PDT May contain affiliate links. Read disclosure. 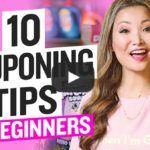 (Ends February 5th at 11:59pm PST) NEW TopCashback members can score a FREE Cascade ActionPacs Dishwasher Detergent Packs + FREE Store Pickup at Walmart, after cash back! Head on over to create an account here! Plus you can choose from Cascade Platinum ActionPacs Dishwasher Detergent OR Cascade Complete ActionPacs Dishwasher Detergent! Cascade ActionPacs dishwasher detergent cleans burnt-on messes in just one wash, with no pre-wash needed. Premium tough food cleaning powers away burnt-on foods, while built-in rinse aid action and the grease-fighting power of Dawn make your dishes dazzle. Plus, Cascade Platinum dishwashing detergent is formulated to help prevent hard-water filmingkeeping your machine looking fresh and clean. TIP: You can add other items to your cart as well, but the cashback amount will remain $13.97.